One of the additional projects involved when modifying or building a motor is getting the timing set correctly. Because a modified engine requires a different timing setup than a stock engine (where the timing mechanisms are designed to work with that particular engine), modifying the distributor may be necessary. With the Datsun 510 L-series motors, one common upgrade is to pick up an electronic distributor from a more modern L-series engine and swap it in. This results in more reliable timing, but not necessarily more correct timing. Added to the complication is the fact that there are over a hundred different electronic distributors used across the different Datsun engines, each with their own timing curves. The electronic distributor in my car (D4K8-08) has a mechanical advance that adds 22 degrees of crank timing (double the 11 degrees of distributor timing), which may be fine on the car that it came out of, but since I've got my initial timing set at 20 degrees, having the timing hit 42 degrees at 4000 rpms will result in severe pinging, and possibly a blown motor. 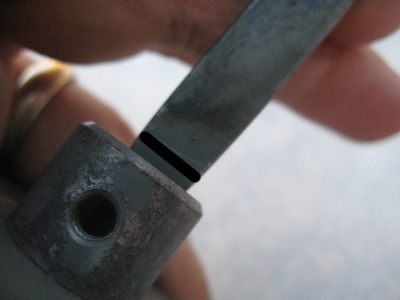 The solution, taken from Jason Gray's distributor modification page, is to modify the advance mechanism to limit the amount of advance possible - this is done by filling in the weight-slots with some JB weld, shorting the length of travel on the distributor. With nearly 3 degrees of crank timing for every 1mm of slot shortening, I've changed the mechanical advance mechanism range from 22 crank degrees down to 15 degrees. Setting my static timing at 20, revving the engine brings me up to 35, which is a tolerable limit for my setup. The other timing mechanism is the vacuum advance canister, which provides additional timing based on a low-pressure signal from the carburetors. Under partial throttle operation, on the intake stroke the piston pulls against the blockage of the throttle plate so vacuum is produced in the intake manifold and the cylinder receives less than a full charge of air/fuel and retains more of the burnt exhaust gas in the cylinder. This causes the fresh (partial) intake charge to burn slower when ignited so earlier ignition is needed to extract maximum energy from the fuel. Not using vacuum advance will give you no real increase in performance and will decrease your gas mileage and increase emissions unnecessarily for street driving. On my distributor, the vacuum advance mechanism provides 25 degrees of advance timing at the crank. With 35 degrees at 4000 rpms, an extra 25 degrees brings the timing up to 60 degrees, which causes audible pinging while cruising around. No good. It turns out that the advance canisters can also be modified. 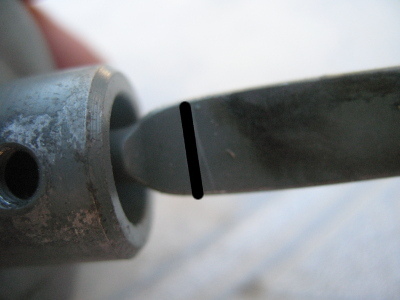 By scraping away at the putty that seals the end of the canister, you can access a screw and pin that can limit the range of motion. Reading that each 1mm of travel on the vacuum advance mechanism provides 4.24 crank degrees of timing advance, I turned the limiting pin in 2mm, which brings down the 25 degrees to a more manageable 16.49 degrees. Driving it around, I noticed some minor pinging (considerably less than what was occurring before), so I set the limiting screw in another 1mm; this has effectively eliminated the audible pinging, although I will still have to confirm any pinging with an electronic stethoscope. So far, so good. I'm going to have my car thrown onto a dyno soon to see what kind of numbers I'm pulling from my build. I don't really have any guesses for the amount of horsepower my engine is putting out, but the car does seem fast. Fixing the timing is an excellent idea. 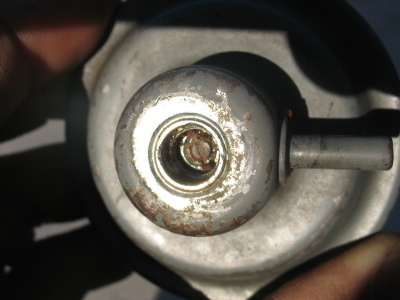 However, it is still needed to check the fuel process flow and exhaust system as well.